Researchers from the Cornell University have developed a methane-based, oxygen-free life form that theoretically may exist in the cold and harsh environment of the planet Saturn’s giant moon Titan, defying the idea that water is necessary for life. Scientists modeled the cell membrane of small organic nitrogen compounds, and it can function in extremely cold liquid methane temperatures: Titan has seas of liquid methane of almost 300 degrees below zero. The cell is made of carbon, nitrogen and hydrogen molecules: they exist in the Titan seas, but simultaneously demonstrate flexibility and stability of the liposome on Earth, according to a study published in Science Advances journal. The cell was called "azotosome" where “azote” stands for nitrogen in French, while “soma” is “body” in Greek. 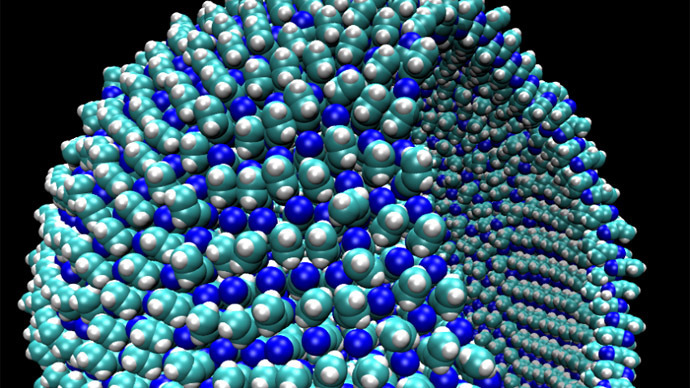 "Using molecular simulations, we demonstrate that these membranes in cryogenic solvent have an elasticity equal to that of lipid bilayers in water at room temperature," said James Stevenson, co-author of the research from the School of Chemical and Biomolecular Engineering at Cornell University. "As a proof of concept, we also demonstrate that stable cryogenic membranes could arise from compounds observed in the atmosphere of Saturn's moon, Titan, known for the existence of seas of liquid methane on its surface," Stevenson said. One of the leading scientists who participated in the study, Paulette Clancy, told Science Times that they had “the right tools” to make it work. “We didn't come in with any preconceptions about what should be in a membrane and what shouldn't. We just worked with the compounds that we knew were there and asked, 'If this was your palette, what can you make out of that," Clancy said. The researchers’ next move would be to attempt to show the cells’ behavior in a methane, oxygen-free environment, and to see what processes would be equivalent to metabolism and reproduction.